Organizational behaviour has major role in business processes of organizations. Scrutiny of the elements of organizational behaviour facilitates a better understanding; predicting and control of organizational behaviour therefore better understanding of communication effectiveness is the key to the overall organizational achievement. Communication is the process to convey the message from one person to the other (Weick and Browing, 1986). However, it is very important that the recipient of the information understands the content and the meaning of the message (Rouse & Rouse; 2005). Weihrich and Koontz stated that the function of communication in the organisation is to join the employees of that organisation in order to accomplish mutual goals. Effective Communication in the organisation is necessary for goal setting of and the development of plans towards their realisation, human and other resources management in the most triumphant and proper way, the choice, the progress and the performance evaluation of the organisation members, the management, guiding, motivating and creating a climate in which people want to contribute, the control over realisation (Weihrich & Koontz; 1994). Fox (2001) avowed that , “Communication in the organisation represents a complex system of the flow of information, orders, wishes and references made out of two partially complementary systems: formal communication network and informal communication network.” Tomasi and Medeiros (2007) stated that communication has a functional and operational definition, understood as a common process (sender, receiver, channel flow and level) of relationships involving humans in a corporate environment. Communication can be recognized from the theoretical perspective known as symbolic interaction. From this viewpoint, Casali (2006) recommended different principle of organizational communication and described communication as “a social process that triggers objective and subjective worlds in creating an atmosphere that is both stable and changing. The organizational communication takes place in conversations, texts and translations which meets the objective definition that communication occurs in organizations and the subjective definition that communication produces organizations" (Casali, 2006, p. 55). 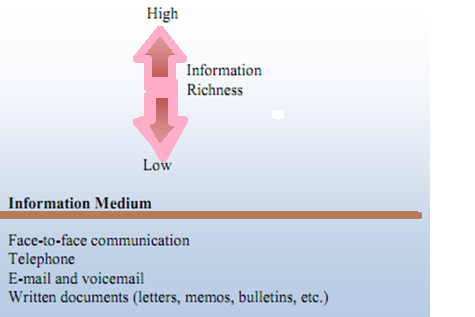 The process of communication involves several elements: There are three major elements in communication process that include the sender, the message, the medium, and the recipient. Communication flows from the sender which is the source of the communication. He sends off the message to the recipient using a particular medium. When talking about the communication within the organisation, feature for the medium are dissimilar immediate conversations, memos, printouts and schemes depending on the content and the aim of the message which the sender wants to convey to the receiver. 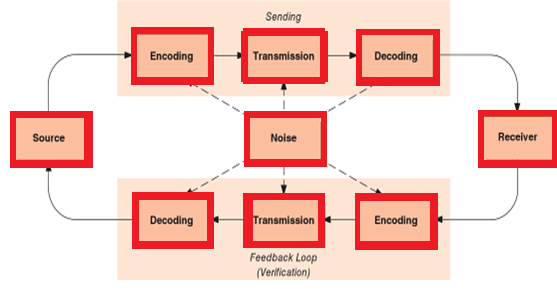 After that the receiver attempts to understand which message the sender wants to convey, although the communication process may sometimes be interrupted by a noise in the communication channel, which can hinder the communication. The problem which often appears within the organisation is getting information overload which leads to a burden, therefore it is important to select only the pertinent information. The critical factor to measure the efficiency of communication is common understanding. Understanding exists when all parties involved have a common agreement as to not only the information, but also the meaning of the information. Effective communication occurs when the intended message of the sender and the interpreted message of the receiver are one and the same. The most professional communication occurs at a minimum cost in terms of resources expended. Time, in particular, is a key resource in the communication process. Efficient time‐saving communications are not always effective. A low‐cost approach such as an e‐mail note to a distribution list may save time, but it does not always result in everyone getting the same meaning from the message. Without opportunities to ask questions and clarify the message, incorrect interpretations are possible. In addition to a poor choice of communication method, other obstacles to effective communication are noise and other physical distractions, language problems, and failure to recognize nonverbal signals. Communication happen in upward communication, downward communication and sideward communication. Upward communication: This communication goes up the official hierarchy, from the lower to the higher level in the organisation. Information goes from the subordinates to the superiors. This kind of communication is mainly used for sending information associated with the proposals system, employees’ opinion, work insight, attitudes and problems of the employees. It is important to secure the freedom of communicating since the main disadvantage of the upward communication is message filtering. 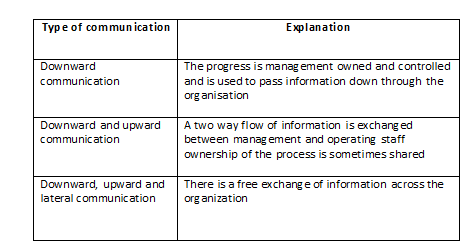 Downward communication: This type of communication flows from the higher to the lower levels in the organisation. It is used to give orders, broadening of ideas and communicational knowledge. It takes up a lot of time, but its most common problem is the loss or denying of information on the path through the chain of command. Sometimes, there is misinterpretation of the directions; therefore a backward connection has to be established in order to confirm the transmission of correct and full information. Weihrich and Koontz term the horizontal and diagonal flow of information a sideward communication, because of their generic joint features. Three-way communication that is downward, upward, and lateral are a characteristic of project organizations in which people are motivated to cross barriers to get the information they need to do the job. 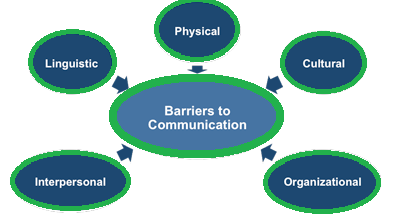 Communication can develop into several different forms such as oral, written and nonverbal form. 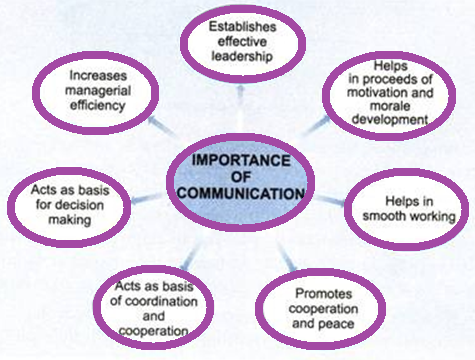 Oral communication: In this type of communication, the spoken word is the main code of the communication. Formal discussions and informal rumours are some of the forms of oral communication. Usual channels of oral communication are phone, video, and face-to-face conversations. There are some benefits of oral communication over other forms of communication, such as the speed of conveying the information and feedback. The drawback is the possibility of distorting the original message. In the business world, oral communication has vital role for successful operation. Written communication: When comparing with the oral communication it is concrete whereby it is much easier to confirm the data. Major disadvantage is that it takes up more time compared to the oral communication and there is not a direct feedback. The written form of the communication is attached to some sort of technology which enables people to transmit the information such as PC, paper, pen. Nonverbal communication: non-verbal communication includes facial expression, gesturing, tone of the voice, look and appearance. Non-verbal communication includes all intentional and accidental information which have no form of written or spoken word (Rouse and Rouse, 2005). There are four elements of nonverbal communication that, in the workplace, can be seen as the most important to understand. Eye Contact: Looking a person in the eyes while they are talking is often considered the ultimate form of respect. Eye contact, or lack thereof, is the first telltale sign of whether you think a person is worthy of your attention. By looking someone in the eyes, you are telling them that what they are saying is important and understood. Body language: How many of us have ever held a meeting to find the other team members slouching in their chairs with their arms folded? This communicates that the recipients are uninterested and may not be paying attention - even if that is untrue. The folding of arms says that you are not open to what others have to say, and slouching says that you are bored or discouraged. Tone: This is communicating with your voice when not using words. Through pitch, volume, and inflection, tone of voice provides powerful clues into your true feelings. For example, tone of voice is a quick indicator of sarcasm, confidence, frustration or agreement. Time: Respecting the time of co-workers could be the most important aspect of nonverbal communication in the workplace. The way a person treats time can show how organized they are or how they regard others. Organizational communications vary in formality. Formal communications are official, organization-sanctioned episodes of information transmission. They can move upward, downward, or horizontally and often are predetermined and necessary to do some task. Informal communication is more unofficial. People gossip, employees complain about their boss, people talk about their favourite teams, they whisper secrets about their co-workers, and work teams tell newcomers about how they operate. When the communication of a single item of data conveys considerable new understanding, that communication is information rich. Communication media vary in their information affluence. Information richness is determined by such factors as the number of channels utilized in the communication medium and the opportunities for and speed of feedback. Face-to-face communication is highly information rich because it utilizes multiple channels such as words, facial gestures, body language to reinforce a message. Face-to-face communication also provides opportunities for instant feedback. Written communication is lower in information richness because it lacks the support of multiple, meaning-confirming channels, and feedback is slower. Communications planning with the good investment of time, resources, and teamwork becomes both a problem solving process and a learning process. Perhaps the greatest payoff that comes from successful use of communication planning which is the basis for future cooperation within the project community. 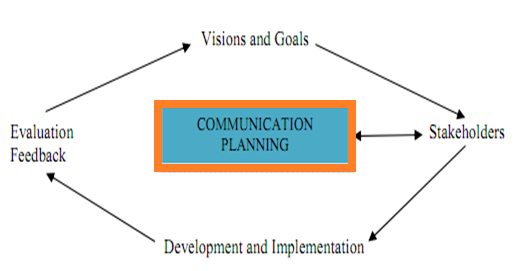 Communications planning usually involves four phases. Within each phase, the participants will normally work through several tasks to accomplish the specific objectives. The phases are Assessment of needs, Formulate plan, Implementation plan, Feedback. In communication process, there are some obstructions also. Roger (1982) argues that the major obstacle to common interpersonal communication is the human tendency to judge and evaluate statements made by other people or groups. Rogers raise concern that some time people do not listen to the message, but rather formulate their own opinion on what they think might be being said. He gave solution to this situation that is the listener should only response to the initial speaker once they have fully understood the idea and feeling of the speaker, and same applies when listener becomes a speaker while giving a feedback. If communication process is not smooth, it has dangerous consequences in organization. One major effect of communication barriers in businesses is that it causes workers to fail to deliver on requested directives. Misinterpreted messages are also an effect of communication barriers in many big and small businesses. Communication has huge function in organization as it serves as the groundwork of every face of a business. Effective Communication is important for managers in the organizations so as to perform the essential functions of management such as Planning, Organizing, Leading and Controlling. Communication enables managers to do their jobs and responsibilities. Communication also helps for planning. All the essential information must be communicated to the managers who must communicate the plans so as to implement them. Organizing also requires effective communication with others about their job task. Correspondingly leaders as managers must converse successfully with their subordinates so as to achieve the team goals. Controlling is not possible without written and oral communication. Managers dedicate a great part of their time in communication. They spend great time on face to face or telephonic communication with their superiors, subordinates, colleagues, customers or suppliers. Managers also use Written Communication in form of letters, reports or memos wherever oral communication is not feasible. Communication keeps the foundation of inspiration. It helps the employer to know how a job is being performed and to improve performance if it is not up to the mark. Communication acts as a source of information and assists in the decision making process and helps to explore the alternative course of action. Communication also helps in developing people’s attitude. A well informed person will always have better attitude than a less informed person. Different forms of communication like magazines, journals and meetings will assist the employees to form different attitudes. To summarize, Communication is a process by which two people exchange information. It plays vital role in any organization. The purpose of communication is to accomplish coordinated actions, to share information and express thoughts and feelings. People in organization communicate through oral, written and nonverbal methods. Organization’s managers, directly involved in the communication process, have responsibility on the way information flows among people.